In 2005 retired executive Oliver Porter created a functional city government for Sandy Springs, Georgia, in less than a year. He had no budget, no formal authority, and to join him. Facing overwhelming odds, Porter pioneered a model in which city services are comprehensively contracted out to private firms. Sandy Springs became one of the most successful cities of its size in the United States, with award-winning city services and public works but no debt or long-term liabilities. 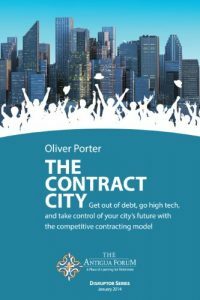 In this book, Porter shows you how your local government can join the growing number of contract cities to get out of debt, adopt new technologies, and take control of your community’s future.